Occasionally I have to move the things around on the shelf above my head so I don't risk concussion. This time when I was shuffling items around, I actually took some of my old book journals down and started paging through them. At first I simply wondered where the volumes for the missing years had gone, but then I remembered seeing posts on other blogs about the books bloggers had been reading in years past. 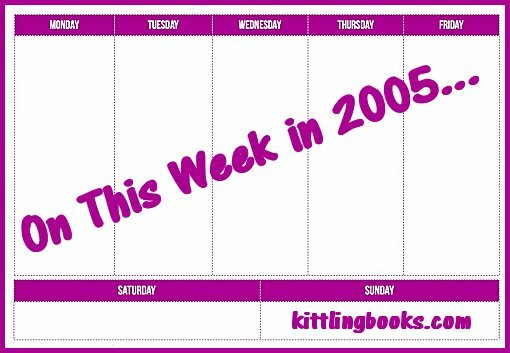 So let's step into my Wayback Machine and take a look at the four books I read on this same week back in 2005. Am I reading the same authors and/or the same type of books now? Let's find out! 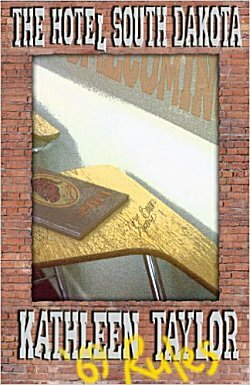 One of the books I read was The Hotel South Dakota by Kathleen Taylor. This is the third book in one of my absolute favorite series, but I haven't mentioned it very often because it went out of print. You should've seen the smile on my face when I looked it up for this post. All six books in the series are available on Kindle for $2.99 each, and it looks as though they are coming out in paperback, too. Torie Bauer is a waitress in a diner in small town Delphi, South Dakota. She's overweight, single, and not at all proud of an affair she had with a married man. Do I still read the same sort of books today? You bet! I still love well-drawn characters and strong mysteries. As for the humor, my tagline once said, "I love laughter," and that has never changed. 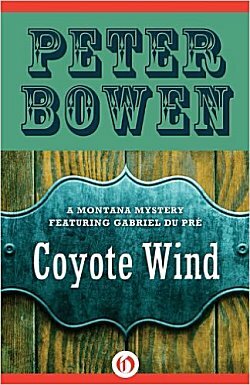 Eleven years ago, I was just beginning another of my favorite series, Peter Bowen's Montana mysteries featuring a one-of-a-kind cattle brand inspector named Gabriel Du Pré. I've loved stories set in the West ever since I was a small child, and Bowen's tales of Montana, Du Pré, his family, and his friends are some of the best you'll ever come across. Du Pré is a bit of a mongrel: French, Native American, English... and he has many grandchildren (who are raised with the common sense of past decades and not the sensibilities of today). He also helps the local police when they're in a bind, which is how he gets to solve so many mysteries. I won't even get into how well he plays the fiddle. I've since caught up with these books, and I miss them. Bowen is a master at weaving the local history and music into his stories, and at writing Du Pré's dialogue so that it shows the musicality of the patois he speaks without making it incomprehensible. The stories are also bound together by humor and by the love a group of people have for each other. I'm so glad I came across this series in 2005! 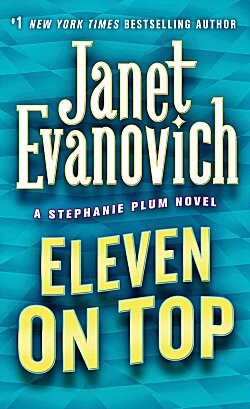 I liked choosing this week because it shows mystery series I was just beginning, and it also shows series that I'd been following for a while, like Janet Evanovich's Eleven on Top. I would imagine that most mystery readers have at least heard of Stephanie Plum the hapless bounty hunter who's unable to choose between two gorgeous males. I have to admit that by book eleven, the series was limping-- at least for me. This is definitely a series that follows a specific formula, and if it's a formula that you love, I am sincerely happy for you. For me, the recipe definitely lost its sparkle, and I finally stopped reading the series around book sixteen or so. But those first six books? Magic! The fourth book I read that week was Elizabeth Kostova's The Historian. Looking at the cover of the book reminds me that I belonged to a few book-of-the-month clubs back then, and this book was one of my book club selections. I dove headfirst into Kostova's story and loved every bit of it. The history, the locations from Ivy League libraries to Istanbul to Budapest to Eastern Europe, the quest for more details of the life of Vlad the Impaler. I've always been fascinated with history and stories that tell about searches through dusty archives filled with long-forgotten documents, and The Historian kept me spellbound. If it were a new book, would I read it now? You bet! Would I re-read it now? One thing you must keep in mind is that I am not a big fan of re-reading. So many books, so little time, and... I've had some very special books ruined for me by re-reading them. Books that fulfilled a very important function in my life at a very specific time. Re-reading them when I was no longer "clinging to a broken spar in the midst of a stormy sea" stripped all the magic from them. Do I think it's silly to re-read books? No. It just means that our brains are wired differently, that's all. I don't know about you, but I found this little blast from the past to be fun. I remembered some things that I haven't thought of for a long time, and it brought back some good memories. I just might have to do this again! What fun to look back and think about what you were reading at a certain time, Cathy! You're lucky you found those reading journals. I think that's one great thing about keeping a journal or a blog: it does help you go back at a later date. Oh, you should definitely do this again. I have had such fun with 'looking back' and will get into that again when my 'break' is over. I noticed that Kathleen Taylor's series was now available as e-books recently too. I think I read the whole series 'back when' and look forward to revisiting it. Love it when old favorites that are out of print are made available. Usually, they can only be found in paperback versions with small, small print that I don't like anymore. And am I surprised at what you were reading 11 years ago - nope. Ha! Please, please do this again! You've reminded me that I've have the first Tori Bauer mystery on my Kindle for FIVE years and haven't read it yet. I must remedy that this summer. Again - loved this, please do it again! I read Kostova's The Swan Thieves and it was sort of meh for me so I never did go on to The Historian. Maybe, maybe not. 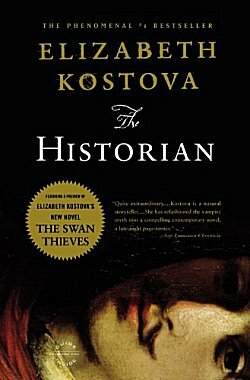 Kostova's first book was The Historian, and I enjoyed it so much that I eagerly snapped up The Swan Thieves. It was definitely meh for me, and I notice that she hasn't written any other fiction. I like books about the West, too, so the first two series sound promising. I especially like the states of South Dakota and Montana. I have to agree on Evanovich, but I do love books that make me laugh. Laughter is often the best medicine. I agree, you should do this again! I agree that you should do this again, the "oldies but goodies" columns. I read a lot of Stephanie Plum's books and laughed very hard, especially in her family scenes with her grandmother and the rest of the relatives. But after many books, I tired of them. It started to be formulaic and repetitive. Yes, precisely why I stopped reading them.